The weekend is here and many of us have probably been invited to a fun party or an event in town. Whichever the occasion, it may be a good opportunity for us to shine. However, it's funny how the best-laid plans can sometimes find themselves broken and yet those last-minute invitations can work splendidly. All that being said, in order to accept an RSVP invitation in a timely manner, having something to wear for the occasion is crucial. I'm a firm believer that incorporating a few dressy pieces in our wardrobes is a must. The excuse of not having too many occasions to wear them has been defeated by the new fashion norms: "Wear everything with everything"
Having dressier pieces in my wardrobe have made my life easier when I need to get ready for a formal, semi-formal event, or even when I want to dress up a casual garment, such as jeans or t-shirts. 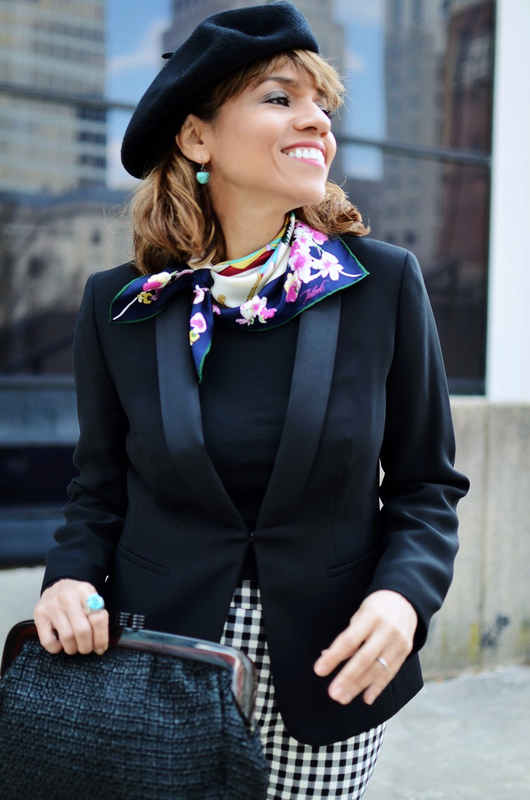 Today, I'm showing a look that I put together with a couple of Talbots items. I wanted to create a going-out look that wouldn't take too long time to style. Dressing fun is important for me, but practicality is also a key factor. I went to my local Talbots store and picked this tailored-fit tuxedo blazer from their RSVP selection. Now, in order to prove to you that one dressy piece can bring casual garments to a level of sophistication, I also picked up a pair of gingham pants and a T-shirt. All these selections are within my style, therefore, workable with the rest of my wardrobe. Owning a dressy piece, such as a tuxedo blazer, will make me react quickly to any RSVP invitations. If the event were formal, I could have styled it with dressy pants or a skirt or over a dress, however, for this opportunity, I styled it for an afternoon semi-formal event. The same idea can be applied to any dressier piece in your wardrobe and remember, dressier pieces are no longer reserved only for formal occasions. You can expand their versatility by mixing and matching them with the casual part of your wardrobe and wear them at any giving time. 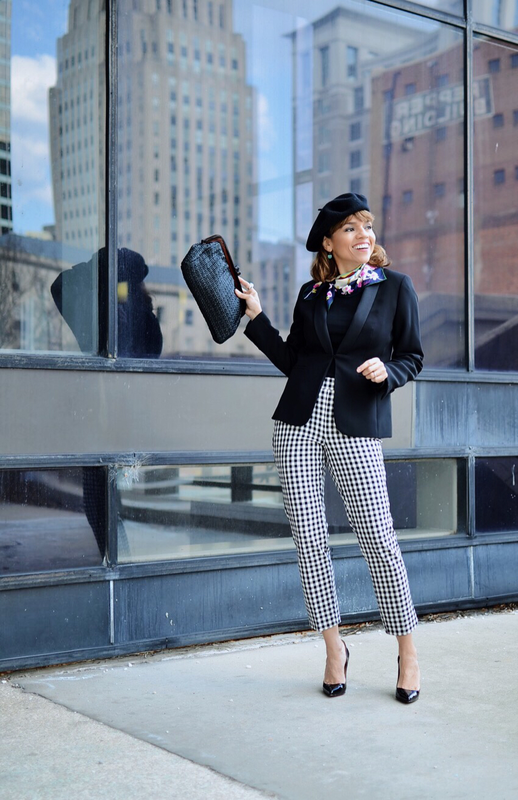 Blazer: c/o by Talbots from RSVP collection which is ideal for any occasion including those magical nights out/Pants: c/o by Talbots/Top. 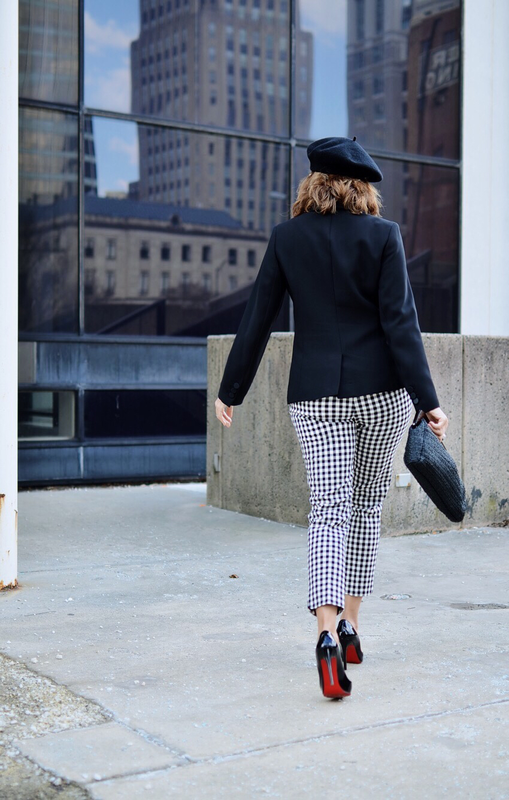 c/o by Talbots/Scarf: Vintage (Talbots)/Beret: Vintage/Shoes: Christian Louboutin/Sunglasses: Vintage/Clutch: Vintage.